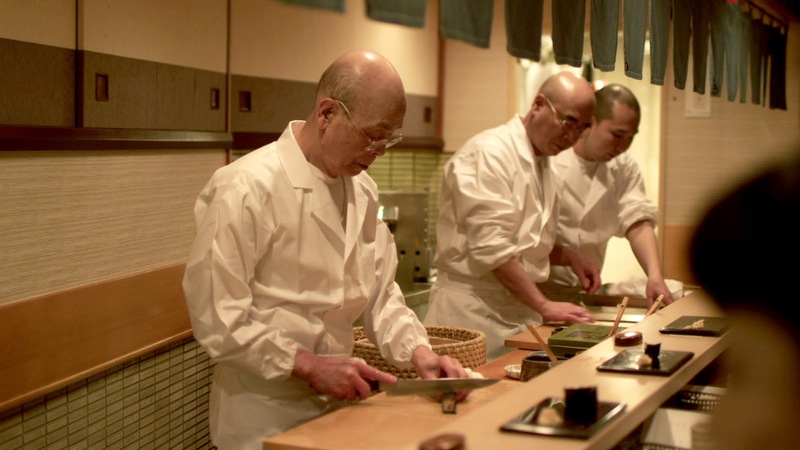 Movie Ramble: Jiro: Dreams of Sushi. Ono Jiro and his sushi dishes. Generally the Robert Burns Centre Film Theatre’s Film Club could not be described as elitist but this week’s film could have been described as such. It was a Japanese subtitled film about a Sushi restaurant in the Ginza district of Tokyo and the family that run it. 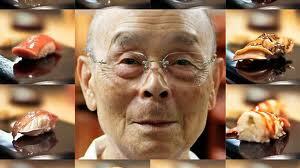 Jiro: Dreams of Sushi (2011) is a recent documentary by an American director David Gelb. 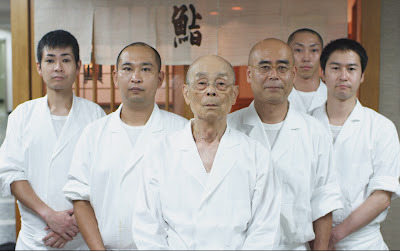 Originally he went to Japan to make a film about a lot of sushi chefs but when he was taken to the 85 year old Ono Jiro’s restaurant Sukiyabashi Jiro he realised that his documentary could only be about this remarkable man, who had worked at sushi for something like 75 years. 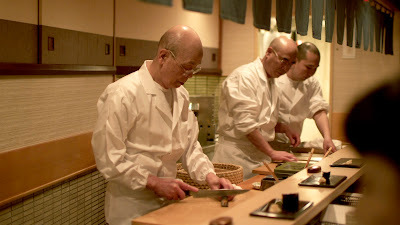 Introduced by Mike Gray, who had spent some time in Japan, told us that Jiro’s sushi bar is an unremarkable establishment of only 10 seats in a Tokyo subway but even so it has a 3 star rating from Michelin and is reckoned to be the very best of its type anywhere, with customers that come from all over the world to sample this remarkable mans obsession with perfection. Mike went on to say that the film was not just about the food but was about the relationship between a father and his two sons. The younger son Takashi left his fathers business to start his own restaurant in a different district while the oldest son, who is now 50 years old and still works for his father, will one day inherit the family business. We also get to see and hear about his customers and the dedicated suppliers of the raw materials. Warning us, that before we booked our passage to Japan to sample the delights of Jiro’s restaurant, to be aware that the 20 piece ‘introductory plate’ will cost you 30,000 yen, which is about £206 at the current exchange rate (not including commission). And it will take you between15 and 30 minutes to eat it! Following the film we were fortunate to be joined by a Japanese gentleman who assisted Mike with the discussion. We learnt interesting facts like the correct way to eat these fish dishes was with one’s fingers and not with chop sticks, that the reason Japan relies on a diet of mainly fish is because of its topography with no flat pastures for rearing animals. Also it has been alleged that the Japanese live longer than their European neighbours because of their large consumption of fish but this was disputed by a member of the audience who pointed out that Scots may die from heart disease but he believed that many Japanese died from stomach cancer because of their large fish consumption. The film was certainly interesting and Jiro was quite a character spouting words of wisdom about how you should dedicate your complete life to your work and trade but as one member of the Film Club pointed out it would have been interesting to hear his wife’s view on the subject. At 82 minutes I felt that it was still to long, I mean how many times do you really want to see someone cut fish up and stick it on a tray? A film for foodies I think. Jiro with family and staff.